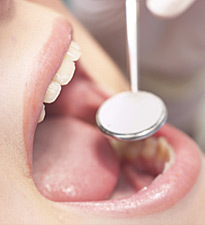 Periodontal or gum assessment is one of the most important things we do in the mouth. The periodontal ligament or tendon attaches a tooth to the supporting bone underneath it. It has the ability to sense pressure on the tooth and can cushion any heavy pressure on your tooth. Healthy gums are also vital for maintaining the health of underlying bone structure. One of the first things we do is establish your periodontal condition as infection and loss of periodontal ligament and supporting bone can happen at any age. Sometimes it is very obvious; most times it is hidden and needs careful investigation. Keeping our teeth for life can only be achieved if we maintain the supporting structures of the teeth in a healthy and stable state. We can assess your current state of health and help you modify your oral hygiene or cleaning routine to maintain the periodontal ligament and supporting bone in a healthy, stable condition.